This pumpkin spice pudding pie is so good. It’s the kind of pie you want to make over and over again because it’s delicious and easy to make. It may very well knock traditional pumpkin pie off your Thanksgiving menu. And no one will complain about that because this pie tastes dangerously similar to pumpkin pie. But better. This pie is based off of my other pudding pie recipes, like this Cookies and Cream Chocolate Pudding Pie and this Best Ever Banana Pudding Pie. 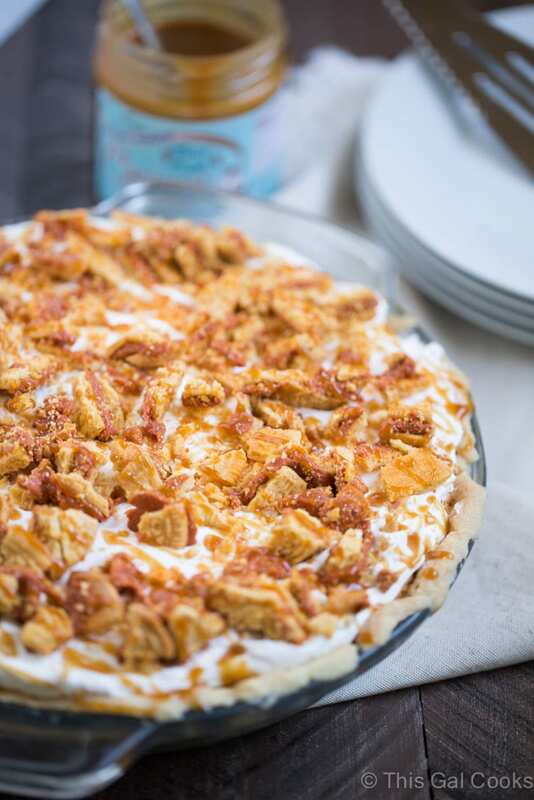 Pumpkin spice pudding and Cool Whip are the base of this pie. 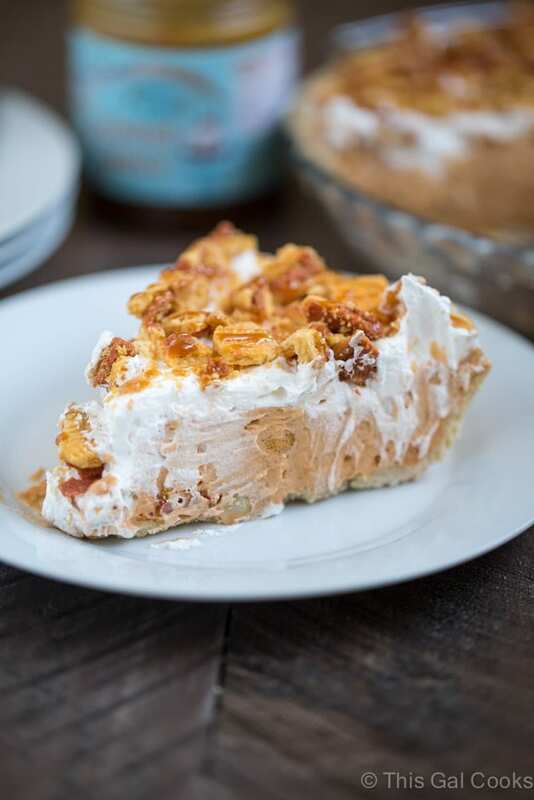 Caramel sauce and pumpkin spice Oreo cookies are fun additions that make this pie exceptionally delicious. You might want to make two of these pies because your guests will be begging for seconds and maybe even thirds. I made this pie with prepackaged ingredients and if you turn your nose up to that, then this pie isn’t for you. 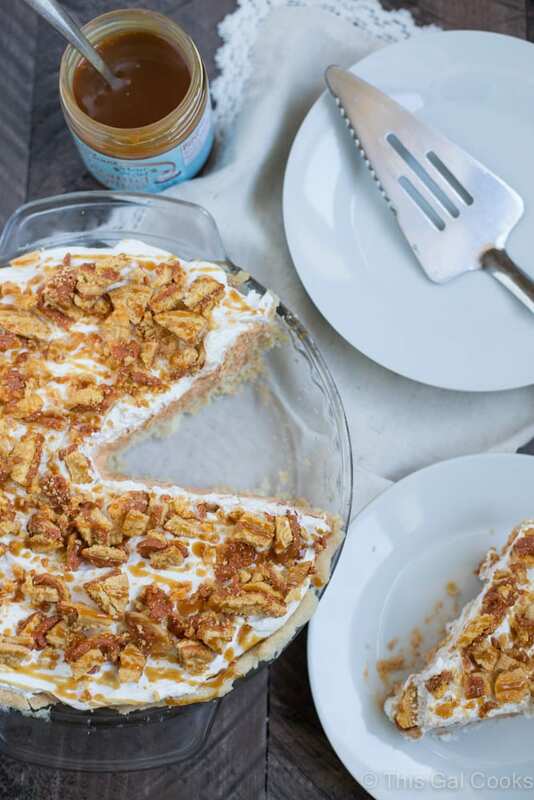 If you prefer made from scratch recipes, I suggest this Pumpkin Spice Cake with Maple Bourbon Frosting or these Pumpkin Spice Bars with Bourbon Butter Glaze. I hope you enjoy this recipe and have a lovely Thanksgiving. In a mixing bowl, whisk together the milk and pudding mix. Stir in half of the Cool Whip and 1 cup of the chopped cookies. Pour the mixture into the prepared pie crust. Cover and refrigerate for 30 minutes or until set. Spread the remaining Cool Whip on top of the pie and then sprinkle with the remaining cup of chopped cookies. Drizzle with caramel sauce. *if you cannot find pumpkin spice Oreo cookies, you may use pumpkin spice biscotti (find it at Trader Joes) or any other pumpkin flavored cookie. Prep time: 10 minutes prep, 30 minutes refrigerations to set the pie. I love pumpkin pie, but this would make it hard for me to choose between the two! Wow! oh my oh my that looks so good! Thanks for sharing on the What’s for Dinner link up! This pie looks absolutely delicious!